Here are the results of a microphone test I performed with some compact electrets and my small Olympus recorder. Read on for a description of the test. Download the files (link near the end) so you can reach your own conclusions. I trust this will be of value for those making similar decisions. Those who read this blog know that I champion small hand-held field recorders. I treat these as Every Day Carry (EDC) devices, in my bag and always to hand. I need never miss recording random encounter with an interesting sound. 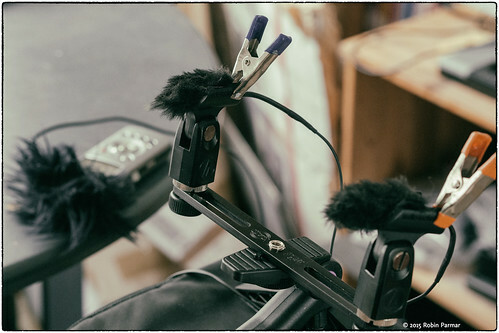 The more "traditional" over-the-shoulder recorders require a backpack filled with bulky material: a pair of microphones, XLR cables, mic stand, spacer bar, and so on. That's fine for professional gigs, but overkill for everything else. The question then becomes one of microphones. The best choice in terms of sound quality would be a pair of low-noise omni condensers, the type designed for quiet studio environments. But then you need a separate phantom power supply and all the associated cabling and supports. Back to square one! Instead, we can compromise by using the 3.5mm stereo input jack, which feeds a small current to the microphone using the scheme known as Plug-In Power (PIP). Unlike other manufacturers, Olympus provides a full 3 V on this input, and enough current to run electret microphones without compromise. Pairing a high sensitivity mic with the LS-11 results in a more than acceptable recording. The most important tip with the LS-11 is to always record at LOW sensitivity. Even if you have to crank the record level up to 10, this results in the best possible Equivalent Input Noise (EIN). Raimund Specht has measured this at -122 dBu (A-weighted). It goes without saying that one should use a 24-bit file format. This allows you to set the levels lower and prevent peaks close to 0 dB, but still have enough dynamic range to avoid the noise floor. If you are recording at low sensitivity in the first place, this is even more important. People debate sampling rates back and forth. I understand the value of higher rates than the CD standard of 44.1 kHz. In the studio, or even in the field with a full phantom power setup, I would use 96 kHz. But not with a small electret. All you get are bigger files with no real return. Unfortunately the LS-11, in a strange omission, does not have a 44.1 kHz 24-bit setting. I use 48 kHz 24-bit instead. Unless I know I will be running into a lot of rumbling low frequencies that might overload the preamps, I leave the High-Pass Filter off, as I did in these tests. For this recording, the record input was set to about 7 on the dial. This put the music peaks at -4 dB on the meters. Later, when I checked the file, the peaks actually measured -3.947 dB -- uncannily close. This tells me two things. The metering is accurate. And my eyes aren't so bad after all! I used three sounds for testing. 1. The room tone. Given that this is my living room in a semi-detached house, you might hear the street outside, birds, and even a cat. The noise floor is dominated by my nearby tower computer. Despite the fact I built it specially to be quiet, it does host 12 TB of storage... something must give. 2. Pre-recorded music. Playback is "Inheritance" from the 2003 remaster of Talk Talk's Spirit of Eden album. The original CD has been ripped to FLAC files. This is played out of a RME FireFace 400 interface. The weak component in the chain is the pair of KRK VXT4 monitors. The monitors are about 1.5 m distant from the microphones. I estimate the maximum sound level to be 80 dB, but that really is a wild guess. The point is, it is not crushingly loud nor whisper quiet. 3. Plastic crinkling. This provides sudden transients and spectra with significant high frequency energy. (Jangling keys are also a good test.) This source is far more likely to stress the microphones than the mastered music. The crinkling is about 1 m distant from the microphones. Three stereo microphone sets were tested. Though they were not needed in this case, wind screens were in place on all mics, to reflect how I would normally use them. The stereo pairs were clipped to a bar with slight toe-in, which is to say angled towards the middle. These omni electrets are available from Audiotalaia in Valencia, Spain. They are one of many hand-made designs based on the Primo EM172 capsule (data sheet), which has rated sensitivity of -28 dB ±3 dB (40 mV/Pa) and self-noise of 14 dB(A). This is equivalent to -106 dBu(A) EIN. I don't remember where I bought these, but they are generic home-built mics using the popular omnidirectional WM-61 capsule (data sheet). Sensitivity is -35dB (17.8 mV/Pa) and self noise 29.5 dB(A). This is equivalent to -97 dBu(A) EIN. The pair of cardioid condensers in the Olympus LS-11 use unspecified caps, so I don't have specs for them. The files are labelled A, B, and C, corresponding to the microphones. For each mic there are two files. The first is a spoken intro. The second contains 33 seconds of room tone followed by the music, and a spoken extro. I split the files in this way so that the second set of files can be exactly synchronised, for accurate comparison. I presume you will bring these into your DAW on separate channels. I have converted the original WAV files to FLAC, to save bandwidth. Please download a ZIP archive from Dropbox. The file peak is -3.261 dB with RMS -25.365 dB. This is the loudest of the three sets, and the baseline for setting the record level. It can be argued that I should have set the record dial to optimise each set of microphones in turn. However, comparison would then be impossible, since the dial has an arbitrary scale and is not calibrated. I would have no way of knowing the difference in amplification between the three cases. The file peak is -11.677 dB with RMS -33.184 dB. The 8.4 dB difference between this and set A corresponds well to the 9 dB difference in calculated EIN. The file peak is -6.092 dB with RMS -27.985 dB. I suggest normalising the peak volume so that set A and B can be compared. Set B then has significantly more noise, prominent even in areas where there is signal to be recorded. This is due to the quality of the noise, which is of a higher frequency content. In short, these mics are "hissy". Since switching to a recorder as good as the Olympus, I have not been happy using the WM-61 caps. It is now easy to hear why. Set C reveals that the built-in LS-11 mics are surprisingly good. Indeed, I have made many pleasurable recordings with them. Where they most definitely fall short is in the stereo field. Closely placed caps are simply not going to compare with microphones placed more appropriately. But there are other significant differences, especially in frequency response. Set A sounds much closer to the original sources, with smoother frequency response and more pleasant tone. Sets B and C have zones of boxiness and woody resonance (to be descriptive). The difference in tone is significant to my ears. This is not necessarily an endorsement of the Audiotalaia microphone, as perhaps any others based on the Primo EM172 would perform as well. I will say that I received my order swiftly and had excellent email correspondence (timely and friendly) from Edu Comelles. The ergonomics of the microphones is good, in that the cable is low mass and thin, though sufficiently long. The price for the integrated stereo pair is €60. Shipping throughout Europe is €5. There is good value in having appropriate wind shields included. To my mind these are not optional accessories but absolute requirements; it is good to see a manufacturer acknowledge this. I could perhaps have built similar microphones myself and saved money, but they would no doubt have been uglier! A search of the internet will reveal many proponents of the inexpensive Primo EM172 caps. I can now add my voice to this chorus. Jez riley French rightly notes that the wind shields on the Audiotalaia mics are made of fake fur. These will filter the high end more than other material that has a less dense backing. The cost is inevitably more bulk. And also the price of such wind shields would be equal to that of the mics themselves. Consider it a worthwhile upgrade to get better shields. I am happy to see something decent ship with a mic, since the usual foam pads that major manufacturers use are practically useless for field recording, only being suitable for controlled studio use. If one has 1000 Euro, consider the DPA 4060, but note that these require external power supply to work at their rated noise and efficiency. In any case, I am generally writing for people without such a budget.